Vehicles are seen during evacuation from Paradise to Chico. PARADISE: A fast-moving wildfire roared through a Northern California town yesterday, with reports of fatalities as it engulfed dozens of buildings and tens of thousands of people fled the flames, police and state authorities said. Driven by high winds and dry conditions, the blaze dubbed the ‘Camp Fire’ swept through the town of Paradise, with social media reports that a hospital, high school and K-Mart store were on fire. State fire authorities said they could not confirm the reports. 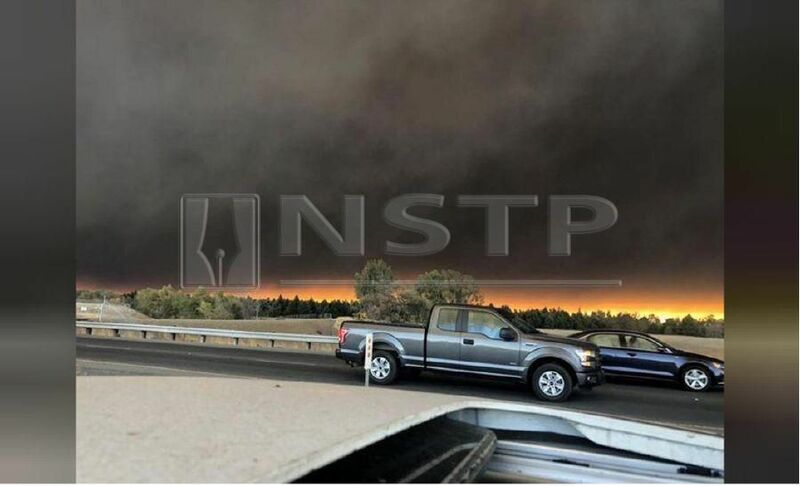 The blaze began early yesterday and quickly charred 3,237ha, forcing the evacuation of the 27,000 residents of Paradise, about 240km northeast of San Francisco, and other communities, the California Department of Forestry and Fire Protection (Cal Fire) said in a statement. California is experiencing one of its worst fire years ever, with 251,610ha burned through Sunday in areas covered by Cal Fire, nearly twice the amount during the same period of 2017 and nearly triple the five-year average.